Truckle Cheesemongers is RVA's very own pop up cheese shop. We feature a well curated selection of amazing cheeses. We focus on bringing in cheese that is hard to find and several of our cheeses aren't found elsewhere in Richmond. Truckle is popping up in RVA's favorite craft breweries and cideries, where we pair our great cheese with each individual flavor profile. Our homemade Beer Cheese is made with local beer and good ingredients. Savory and sharp, our Beer Cheese has a carefully balanced blend of spices that gives way to a kick of heat at the finish. Follow us on Facebook, Instagram, and Twitter, and you'll hear where we'll be next. Ashland Meat Co. @ Cross Bros. carries our cheeses as well as an amazing selection of local meat and produce. Check them out! Blue Bee Cider carries "Truckle Trios" in their tasting room! What's a Truckle Trio, you ask? It's three pieces of whatever we have in stock that tastes great with cider! The Butterbean Market & Cafe carries our cheeses as well as our homemade Beer Cheese. Head over to Manchester and visit this gem! Cardinal State Butchers carries our cheeses and our homemade Beer Cheese. They also have an amazing selection of fresh meat and seafood. Castleburg Brewery has our homemade Beer Cheese made with their Murder Hole DIPA. Storm the castle! The Cheese Shop in Williamsburg carries our Beer Cheese. Go for the history and stay for this amazing shop! Ellwood Thompson’s now carries our homemade Beer Cheese! Pop in for an awesome local shopping experience! Libbie Market now stocks our homemade Beer Cheese. Stop in for all your Virginia specialty items! Outpost Richmond now stocks our homemade Beer Cheese! Go there for all your bicycling and specialty grocery needs. One of the coolest shops in the city! Stella’s Grocery Scott’s Addition stocks our homemade Beer Cheese. They have awesome food and lots of local goodies! Strangeways Brewing carries our homemade Beer Cheese made with their Hop Howler IPA. Grab some next time you visit the tasting room! Tuckahoe Seafood carries our cheeses and our homemade Beer Cheese! They have an awesome selection of fresh seafood! Our next Truckle Cheese Share pick up is at Blue Bee Cider on Wednesday, April 17th. Haven’t signed up yet? It’s easy! Just email cheese@truckleRVA.com and let us know if you want to eat amazing cheeses for 3 months or 6 months. We are thrilled to do a class at Mise En Place on April 24th. 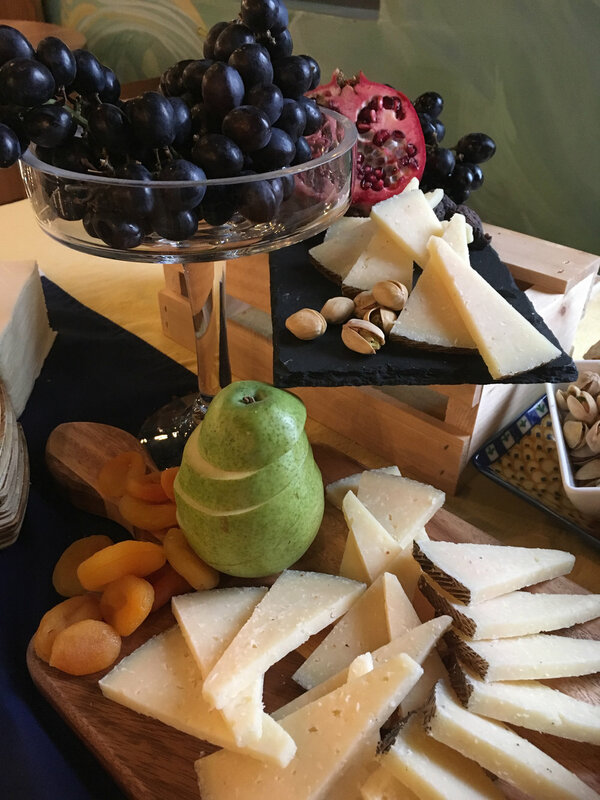 We’ll be talking about cheese basics, how to buy cheese, and will delve into the exciting world of pairing cheese with beverages and other foods. Grab your tickets today! Come see us at the Virago Spirits Women Owned-Business Mother’s Day Market on Sunday, April 28th from 2-6! There will be a variety of wonderful vendors. Mark your calendars now! We can’t wait to pop up for the very first time at Final Gravity Brewing on Friday, May 10th from 4-8! We’ll have Beer Cheese and our Truckle Totes. Come have a beer and talk cheese with us! We’ll be at Outpost Richmond on Saturday, May 11th from 11-2 tasting out our homemade Beer Cheese! Preheat oven to 450. Mix flour, baking powder, salt and sugar. Cut cold butter into little chunks and add to flour mixture. Add Beer Cheese and use a fork to mix butter and Beer Cheese in until they are broken down somewhat. Throw a pinch of baking soda into the buttermilk and add to the flour, butter, Beer Cheese bonanza. Use a spoon to roughly mix it and then knead with your hands until it comes together. Don’t over knead or they’ll be tough! Pat biscuits down and bake for 16 minutes or until the tops are golden brown. Drizzle with AR’s Hot Southern Honey for an extra delicious sweet, hot kick! Welcome to the table! Each month, we will curate a thoughtful selection of cheeses that are ready to enjoy. Great as a holiday gift for yourself or the cheese lover in your life, our cheese subscription is available in 3 month or 6 month options for $35 per month. Ready to join? Simply click the button below to email cheese@truckleRVA.com and we’ll reserve your cheese! Please include your name, phone number, and if you would like the 3 month or 6 month option. Our next pick up is from 5-8 on February 20th at Blue Bee Cider. Our inaugural cheese share debuts with the famed Black Betty Goat Gouda. Black Betty is one special lady - she’s available once a year, only to qualified merchants and once she’s gone, she’s gone! Aroma - Rich caramel, fresh bread. Flavor - Deep, sweet and nutty with a salted caramel goat finish. Aroma - Sweet, grassy. Flavor - Bright and lactic, savory and meaty. A perfect example of an aged American cheddar. Aroma - Butter, earth, blue mold. Flavor - Sweet cream, butter, salty tang of the blue veining gives way to a beautiful lanolin finish. First comes the cow, and then the sheep! Made in the traditional way of Roquefort but out of the protected region and with mixed milk. Yum! This traditional Christmas cheese is hand-ladled, giving it a superbly delicate mouthfeel. It’s often referred to as the King of Cheese and for good reason! Aroma - Earth and rich milk. Flavor - Butter, blue and barnyard sweetness. This is a great example of a cheese that is simple and perfect! Aroma - Bread, sweet milk. Flavor - Olive oil and sweet lanolin. A 16th century butter glut led the makers of Emmentaler to stop skimming the milk and Rahmtaler was born! Fun fact: “rahm” means cream! Aroma - Fruity, floral. Flavor - Butter, hazelnut, grassy sweet cream. Everyone loves a good cheese board! Be it an intimate gathering, a formal function, or a corporate event, we offer customized boards and totes for your guests. Contact us at cheese@truckleRVA.com for more info and pricing!